If you want to learn how to play Bid Euchre, join us for lessons at 10:00 am on Monday mornings. 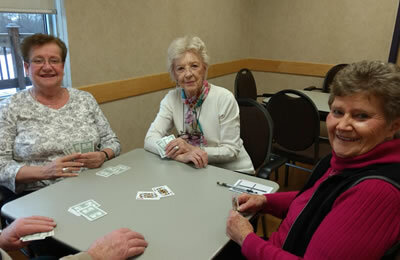 If you already play Bid Euchre, you can join the other enthusiasts each Tuesday and Thursday at 1:00 pm, and Friday nights at 7:00 pm in the Card Room of the Seniors Centre. Remember, Bid Euchre is GOOD FOR YOU! It stimulates the brain, makes you think. You have to make a bid with the cards dealt to you and then remember which cards have been played. That’s all good for you! You’ll also meet some very nice people and have lots of laughs!